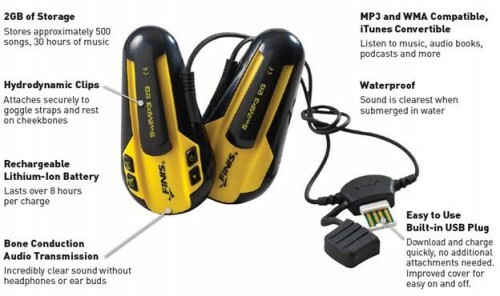 New in November 2011 the Finis SwiMP3.2G is a waterproof MP3 player specifically designed for swimming and is an upgraded replacement to the original Finis SwiMP3.1G. In our personal experience its ease of use due to its cheek pads (no need to fiddle with earbuds) makes it our first choice for an underwater mp3 player for swimming. The Finis SwiMP3.2G costs £109.98 and is designed to be comfortable used with all types of swimming goggles. This latest model offers twice as much storage as the original unit. A total of 30 hours or approx 500 songs can be played using its 2 Gbyte of memory. The Finis Swimp3.2G uses a unique Finis patented bone-conduction technology via cheek pads to deliver a crystal clear sound underwater. This is great for breaking the monotony of swimming lap after lap underwater in silence. Finis created the SwiMP3.2G specifically for swimmers so they could swim to the clear undistorted sound of the music to motivate their workouts. This waterproof MP3 player offers a truely unique and inspiring swimming experience. The SwiMP3.2G uses bone conduction via cheek pads whereas standard waterproof mp3 players rely on the transmission of sound through air or water using earplugs. This means reliance on the quality of the earplug seal which can cause the user to hear a distorted sound. Moreover any break in the the earplug seal means that water can cause the sound quality to become muffled in the ear canal. The SwiMP3.2G allows for swimming to the sound of crystal clear music ear bud free. The Finis SwiMP3 with its bone conduction cheek pads allows for a consistantly reliable clear sound in the swimming pool. From personal experience of this product we recommend you use normal earplugs to keep water out of your ears and cut out peripheral pool noise when underwater when using SwiMP3. 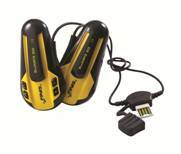 This will give you a better sound quality experience with your SwiMP3 waterproof MP3 player. The Finis SwiMP3.2G greatly enhances the enjoyment of swimmers and triathletes when in the water. It is a safe and proven technology that Finis has offered to the wide range of watersports enthusiasts for the past 5 years. The new version of the SwiMP3.2G features 2GByte of storage that can hold up to 500 of your favorite tunes and is free of cumbersome ear buds.